Mahindra XUV500 vs Tata Aria Pleasure: Which is more value for money? It’s a comparison that’s waiting to happen. The Mahindra’s XUV500’s closest rival is the Tata Aria. Given similar price points, which of the two is a better deal? The Aria and the XUV500 are pretty similar when it comes to power specifications. Both vehicles are powered by a 2.2-litre common-rail diesel engine. The Mahindra XUV500 puts out 140 bhp at 3,750 rpm and 330 Nm of torque at 1600-2800 rpm. The Tata Aria puts out 138 bhp and 320 Nm of torque. Also see: Mahindra XUV500 vs Toyota Fortuner! However, they are radically different in their transmission, drive type and chassis. The XUV500 drives the front wheels through a six-speed manual transmission, while the Aria drives the rear wheels through a five-speed manual transmission. 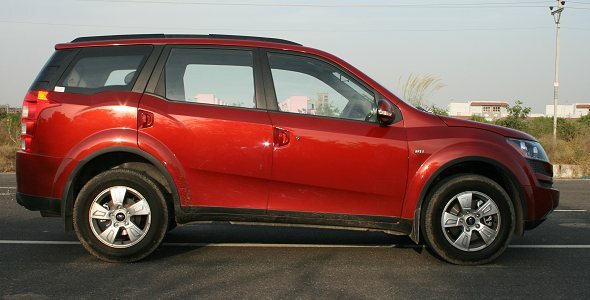 The XUV uses a transverse engine layout while the Aria uses a longitudinal layout. The XUV has a monocoque chassis design, while the Aria has a traditional body-on-frame design (which makes the Aria a lot heavier than the XUV). The Aria is also longer than the XUV. These differences show in the completely different types of handling both vehicles show. Acceleration feels quicker in the XUV, as it is significantly lighter. However, on hard acceleration through corners, the Aria’s rear-wheel drive system tends to push the rear out more while the XUV tends to understeer, being a front-wheel drive vehicle. The W8 variant of the XUV has an electronic stability program and traction control to prevent it from getting out of control. The Aria Pleasure 4×2 doesn’t have this feature. Both vehicles have all-round disc brakes and ABS. Having driven both the Aria and the XUV, we feel the XUV is slightly quicker and more nimble than the Tata Aria. Photo: The Aria's interior is classier than the XUV500's. When it comes to space, the Tata Aria clearly has more of it than the XUV. Not that the XUV isn’t spacious – it has great legroom in the middle-row. The third row is both the Aria and the XUV is slightly cramped for legroom. But where the Aria scores over the XUV, is that it has useable luggage space behind the third row, even with all three rows in use, while the XUV has next to none. The suspension set up on the XUV is an all-independent affair, with each wheel featuring independent suspension. The Aria has an independent set up for the front wheels, but the rear-axle is non-independent. In terms of seating comfort, it’s hard to pick between the two. The heavier Aria, though, feels more planted, although it has a significant amount of body roll on corners. The lighter XUV fitted with a stiff suspension setup tends to pitch and throw passengers on minor rough patches, more than the Aria does. Overall, in terms of space and comfort the Aria is marginally better than the XUV500. Looks are purely subjective. Both the Aria and the XUV500 have radical looks. While Tata has tried to maintain the familiar family look on the Aria, with the wide smiling grilled and swept back headlamps, it takes some time to get used to it. The rear of the Aria is quite van-like and it also resembles the Toyota Innova in profile. The XUV500 on the other hand is extreme in styling. Radically styled front-end, muscular fenders and cuts and curves everywhere give it a rather flamboyant design, which actually makes the Aria look very ordinary in comparison. However, when it comes to fit and finish – it’s again a mixed bag. The Aria has better quality plastics than the XUV500 overall, but fit is an issue. There are gaps and loose bits around the Aria’s cabin. The XUV500 has cheaper-looking plastics especially on the center console area, but the fit is better. The XUV500 also has a busier looking dashboard – with a plethora of buttons and larger display screen, along with radically styled instruments. Overall, it’s a tough call, and we should call it a tie between the Aria and the XUV500 on looks, fit and finish. 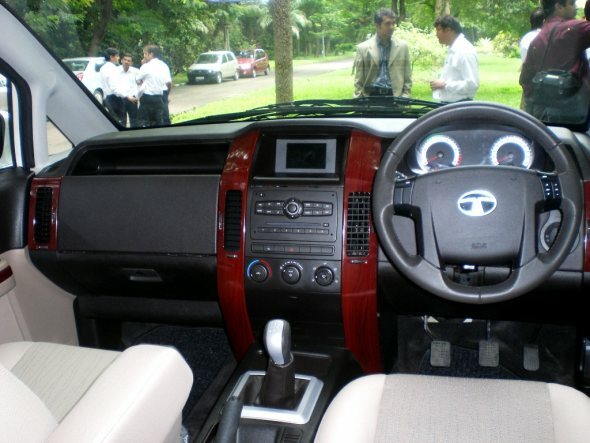 The top-end Tata Aria is the one that’s loaded with features – and comparable to the XUV500. But that variant is much more expensive. So keeping price points similar, we are comparing the Aria Pleasure variant with the XUV500 W8 variant. The XUV500 W8 clearly has more features to offer than the Tata Aria Pleasure. It has six airbags to the Aria’s two airbags. It offers cruise control, Bluetooth phone system, voice commands, automatic climate control, ESP, hill-descent control, hill-hold function, static bending lamps, lounge lighting, telescopic steering, power fold mirrors, conversation mirror, chilled storage box, alloy wheels and leather upholstery – all features that the Aria Pleasure does not have. The Aria offers more cubby holes for storage and a better sounding music system, but that about tops of any advantage it hoped to have in terms of features. Clearly, when it comes to features the XUV500 W8 is loaded compared to the Tata Aria Pleasure. And then there’s the price, which is unbeatable. The XUV500 has managed to undercut the Aria by nearly Rs. 65,000 variant for variant. The XUV500 W8 is priced at Rs. 11.95 lakh ex-showroom Delhi, while the Tata Aria Pleasure 4×2 is priced at Rs. 12.61 lakh. This clearly gives the XUV500 the advantage in terms of overall value for money when you consider the features it offers as well. When it comes to mileage too, the XUV500 delivers more. Claimed mileage for the XUV500 is 15.1 kmpl, while the heavier Aria is rated at 13.7 kmpl. During our tests, we managed to match and even better the XUV’s claimed mileage, while the Aria gave only about 10.5 kmpl in city conditions. Overall, the XUV500 is cheaper, gives better mileage and is much better value for money compared to the Tata Aria. The Mahindra XUV500 and the Tata Aria are tough competitors. They have similar power specifications and comfort levels, although the Aria can hold more luggage. But when it comes to handling, price, features and overall value for money, the XUV500 is clearly much better value than the Tata Aria. Going by the initial bookings of the XUV500, it’s clearly selling more than the Tata Aria – which has managed an average of just 250 vehicles a month compared to the XUV’s 8,000 bookings within the first week of launch. What should Tata do to make the Aria better value? Share your views. « Diwali Car Discount and Deal Guide: Best deals for car buyers in October!